The quintessential Montclair spirit Pom-Pom hat has been re-released by Studio042 through it MontclairMounties.com product line. Montclair Pom-Pom Hat goes perfectly with the Team Spirit Flag. Photo by Eve Mahaney for The Montclair Dispatch. The MHS Winter Spirit season can officially begin! Studio042 has re-released the ubiquitous Montclair Mounties Spirit Pom-Pom hat. This year’s release is only available through MontclairMounties.com and their retail location inside Studio042 on Bloomfield Avenue. 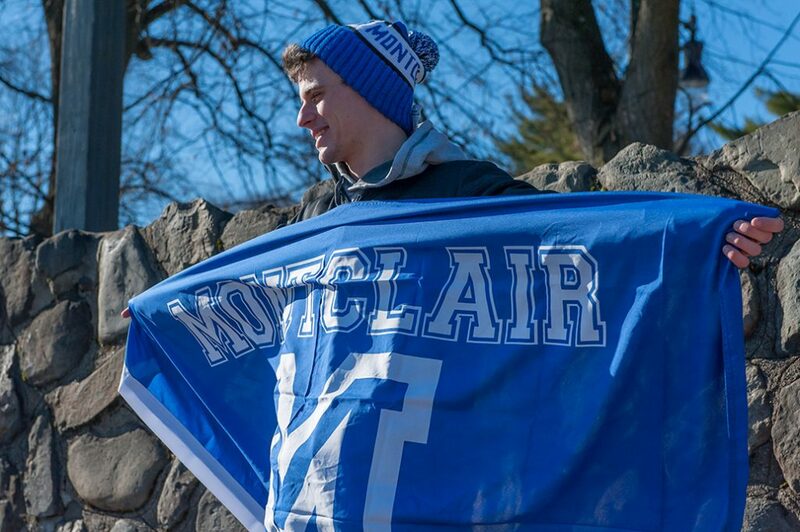 The royal and white perennial favorite with its signature 4” pom has been helping Montclair High School students show their team spirit since the early part of this decade. A generous, long, double knit rolled cuff is a welcome addition enabling the hat to be rolled down over the ears when the bleacher temperatures drop below freezing at championship games. Perfect in any weather condition, be it rain or shine, these Montclair hats will keep you warm. Studio042, established in 1989, rolled out the MontclairMounties.com site and brand in 2011. The Kennedy’s, local owners and MHS parents, have always been strong supporters of the MHS community. Donating tens of thousands of dollars in cash and untold thousands in products over the decades, to all manner of individuals and groups. 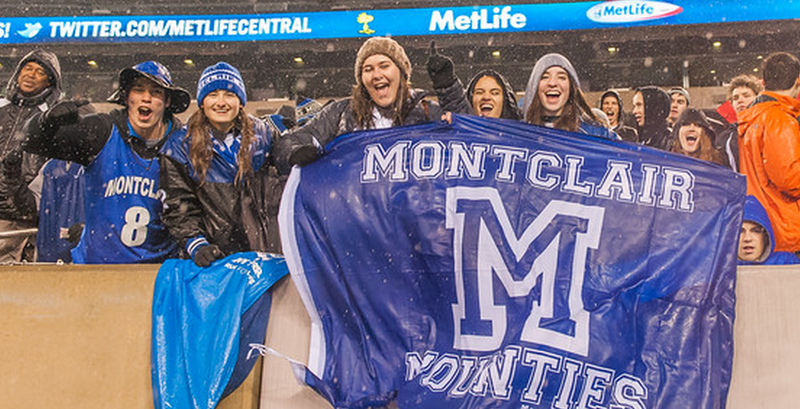 100% of the profits from the MontclairMounties.com sits sales go directly back into the MHS community. Groups like SVPA, MFEE, Project Graduation, cheerleading uniforms, CGI, CSJ, robotics, football, and so on, all have benefited from the Kennedy’s generosity. Just one of these groups, Project Graduation” has received nearly $5,000.00 since the launching of the MontclairMounties.com site. MontclairMounties.com Pom-Pom Hat. Photo by Eve Mahaney for The Montclair Dispatch. 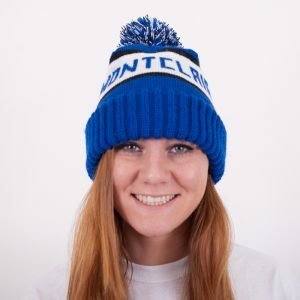 The Montclair Pom-Pom hat in royal blue and white with “Montclair” knitted into the body is a generous 12” tall when its broad 4” cuffs are rolled down over the ears. One size fits everyone. 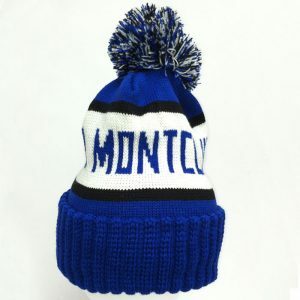 The Montclair Pom-Pom hat is only available at MontclairMounties.com and through their retail location inside Studio042 for $18.00. All purchasers receive a free spirit gift with each purchase. Bulk purchases at a discount for team or club use are available only through Studio042. Also available on MontclairMounties.com and through their retail location inside Studio042 are the official MontclairMounties.com team spirit flags at 4 feet by 6 feet, the smaller Fan Flag at 18” x 24”, as well as the auto window decals with the official Montclair “M” in both traditional and LGBTQ colors are available. All profits support the MHS community. Official MHS Team Spirit Flag, File Photo.